Ristiseiska (Finnish for "the seven of clubs") is a card game popular in Finland. The idea of Ristiseiska is to build a rectangular grid of cards on the table, according to specific rules. At the start, the entire deck is dealt out among the players. The person holding the seven of clubs must begin, and play proceeds clockwise from there. 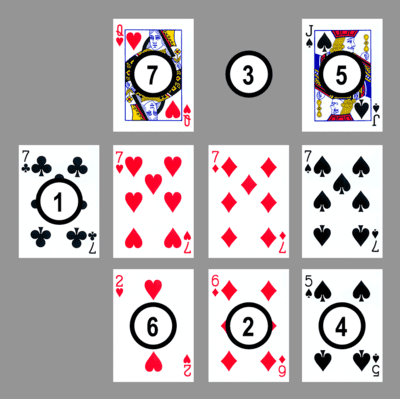 On a player's turn, he/she must place a card from his/her hand on the table if at all possible. The grid on the table is divided by suit, with each suit consisting of three parts: the seven, a pile growing from the six downwards, and a pile growing from the eight upwards. Aces rank low. The first card to be put on the table must be the seven of clubs. A suit may only be started with a seven. If the seven is already on the table, a six may be added, and if a six is already on the table, an eight may be added. The two piles corresponding to the suit then grow number by number, one towards the king, the other towards the ace. If a player has any card that can be played, he/she must play it. Otherwise he/she has to take a card from the previous player, this is selected by the previous player and given face down. Upon playing a king or an ace, a player can choose to play an additional card as well. The best number of players is from three to five. It is possible to play Ristiseiska several rounds and count the score. The players can decide before starting, that they will play until someone reaches certain score, say for example, 100 or more points. Ace is 1 point (as its value is one), Jack is 11 points, Queen 12 points, King 13 points. In one variant of the card game, if a player passes their turn, they will not receive card from previous player but a token (e.g. coin). When someone else passes, the token is moved. As someone wins the game and the round ends, the player who was left with the token gets penalized with extra points (21 extra points is common).